This week 2 young Swallows were returned back to the wild. Donald and Lucky the Second arrived at the Shelter as extremely young birds having been found at a stables in St Saviours on the 11th August. After nearly 4 weeks of care primarily by Senior Animal Care Assistant Yvonne Chauvel and Animal Care Assistant Beckie Bailey the young birds were ready to release to the wild and on Tuesday Beckie popped in on her day off to take them back to where they belonged before what will be an epic migration. Earlier today Gareth the Gannet was returned back to the wild after three weeks of rehabilitation at the GSPCA. The young bird was rescued weak and thin three weeks ago at Port Soif by Animal Collection Officer Geoff George and spent over a week in our intensive care room for large sea birds and sea mammals until he was fit enough to be placed on to one of our rehabilitation pools. After nearly two weeks on our pools it was decided with his fitness much improved and the fair weather to release him on the north of Guernsey. 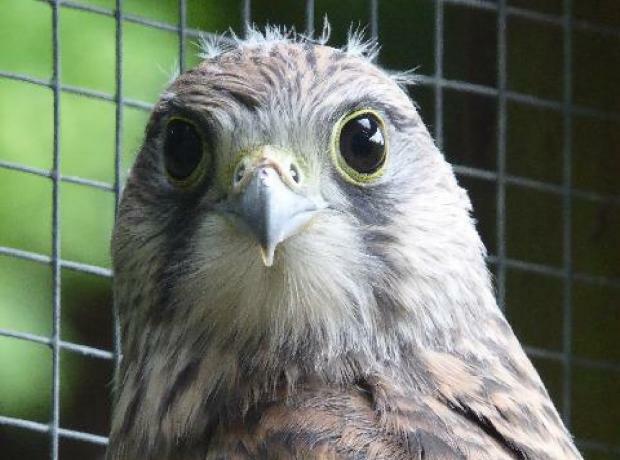 Three weeks ago a young kestrel was found and rescued on Lihou Island and brought into the GSPCA. The young bird which was called Sue and since the 1st July the bird has been hand reared and then placed in a rehabilitation aviary. Last week when Sue was checked over what was thought to be a she is in fact a he, and he was rung with an ID ring before his release. In the last few days Sue was deemed fit enough to be returned to where he was found and we are pleased to announce that he was released back on Lihou earlier this week. After 6 weeks of hand rearing and rehabilitation baby Barn Owl Archimedes who was close to death on entry was returned to the wild this weekend. The young bird was severely thin and very close to loosing his life and was found near to Candie Gardens very early in the morning in early June. 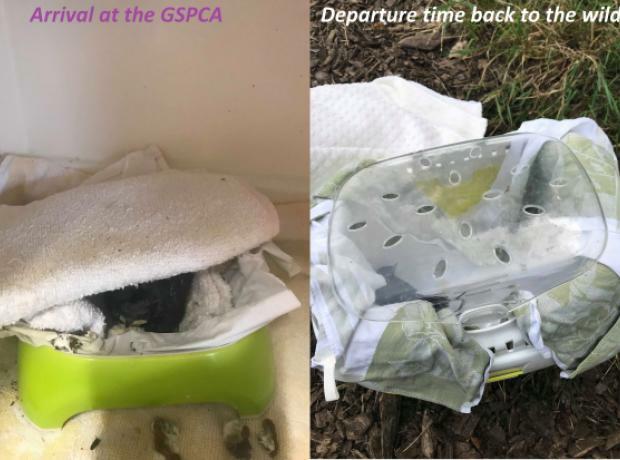 Thankfully with the skills of the team at the GSPCA and an intensive care unit the young bird survived his first week and as he improved we weaned him to eat himself and then placed in an aviary to see how he fed on his own. 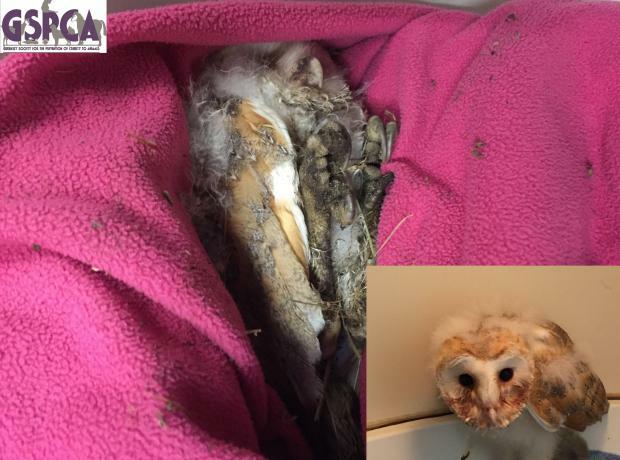 Last week one of the GSPCA Volunteer Night Wardens were called out to rescue a very sick, weak and starving baby barn owl in St Peter Port. The young bird was severely thin and very close to loosing his life and was found near to Candie Gardens very early on Thursday morning. Thankfully with the skills of the team at the GSPCA and an intensive care unit the young bird has survived his first week and today started to eat on his own. After a period inside we plan to transfer him to an outside aviary where he will learn to fly and forage for food. We are pleased to update that Bonnie the grey seal pup rescued below the cliffs on the south coast of Guernsey last month continues to improve. Since being rescued at only 14kg in weight she has responded well to treatment and is putting weight on daily enjoying large numbers of fresh fish. We are hoping in the next few days she will be ready to go out into the pools to start the next stage of her rehabilitation. 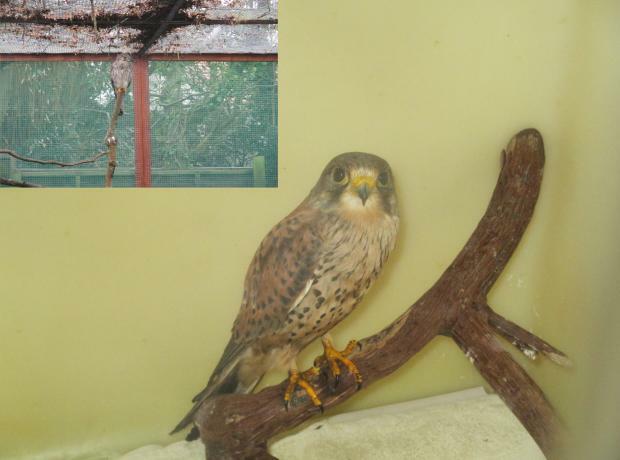 Last week 2 kestrels were rescued in 2 days. The first bird now named 'Bradshaw' after the finder who is actually one of our Volunteer Wardens was found stunned in the road and is a young adult. He was found on Friday on Braye Road and after a few days care he is now ready for release which will be done after all the checks have been completed. The second bird was rescued on Saturday on L'Ancresse and is a much older bird that was found coated in oil. Nearly 4 weeks ago the GSPCA were called out to rescue an emaciated grey seal pup. We are pleased to report that Bonnie is doing very well and is putting on weight each and every day. Her thin body and neck is putting on that much needed fat and she is eating extremely well going through 3-4kg of fresh fish every day. Still under weight for her age it will be at the very least 6 weeks or so before she is fit, fat and well enough to be put back in the wild.